A season ago, Northfield’s girls basketball team entered the sectional as heavy favorites only to be upended by Tri-Central in the title contest. The Class A No. 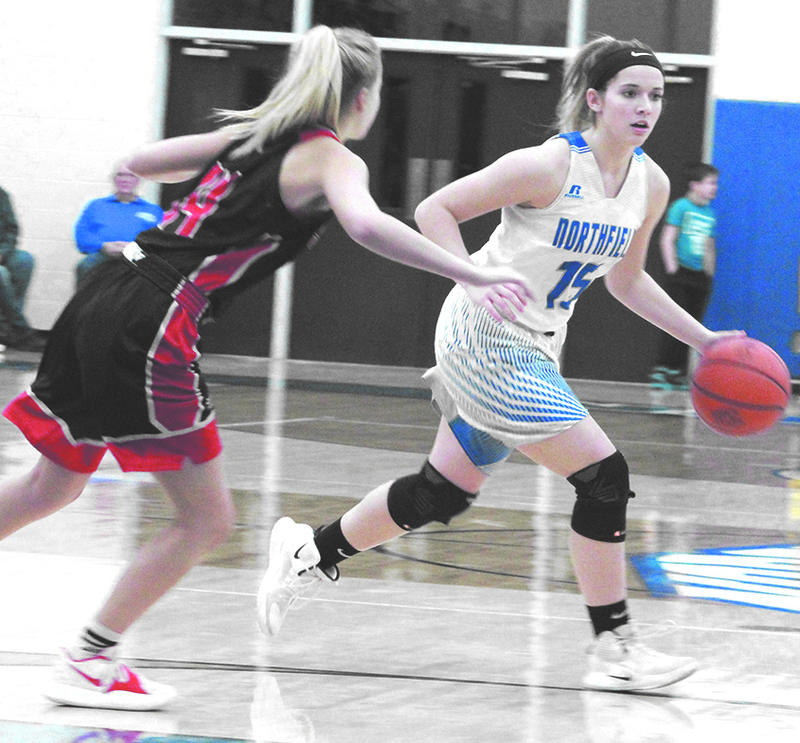 4-ranked Lady Norse made that heartbreak a distant memory Saturday night, routing county rival Southwood 58-31 to claim the program’s first sectional title since 1980. Northfield (23-2) overcame somewhat of a slow start. Southwood matched the Lady Norse blow for blow in the early going, and took a 9-8 lead into the second quarter. Northfield took control from there, outscoring the Lady Knights 23-6 in the second quarter to build a substantial lead by the half. “We just don’t have the firepower that they have,” Southwood coach Chad West said. “We just said ‘be within striking distance after four minutes.’ That was the goal, just to compete those first four minutes. We definitely exceeded that. We had the lead at the end of the first quarter. We came out ready to go. But, they’re a really good team, really smart. They were able to adjust. Back to back 3-pointers from Ariel Dale and Kelcie Thomson helped give Northfield the lead for good at 15-9. The Lady Norse went on to outscore Southwood 16-6 the rest of the quarter to take a comfortable 31-15 lead into the half. Another Dale trey, this one from the top of the key, put Northfield up 38-19 with 5:40 left in the third quarter. Dale stayed hot from distance, canning another triple at the 1:32 mark to give the Lady Norse a 47-21 lead. Northfield took a 48-25 lead into the fourth quarter, where they outscored the Lady Knights 8-6 in the final stanza. Dale led Northfield with 26 points, four rebounds and three steals. She had 21 points through three quarters. Dale said last year’s loss to TC has remained in the back of her mind. Addi Baker added nine points and six rebounds in the win, and Thomson added eight points and five rebounds. Sierra Stout led Southwood (5-19) with nine points, four rebounds and two steals. Alissa Pershing added eight points, three rebounds, two steals and two assists, and Morgan Farr finished with six points, two steals and two assists. Northfield will advance to the Class A Tipton Regional Saturday, where they will face the winner of the Southern Wells Sectional. The championship game of that sectional was to take place Monday night between Daleville (13-9) and Cowan (9-15). Northfield’s girls basketball team defeated Clinton Central 79-34 in the opening round of sectional play Thursday night. The Lady Norse built a 25-10 lead by the end of the first quarter and never looked back. assists and two steals. Kelcie Thomson added 14 points, five assists, eight rebounds and six steals, and Ally Keaffaber finished with 10 points, two assists and two rebounds. Northfield’s girls basketball team defeated Tri-Central 74-28 in sectional play Friday night. The Lady Norse built a 39-13 lead by halftime to put the Lady Trojans away. Ariel Dale again led Northfield with 21 points and seven rebounds. Addi Baker added 16 points, nine rebounds and four steals, and Kelcie Thomson added 12 points, seven assists, 12 rebounds and three steals. Kyra Kennedy rounded out the leaders with 12 points and five rebounds. Southwood’s girls basketball team defeated Frontier 56-27 in sectional play Friday. The Lady Knights built a 30-9 lead by the half to put the Lady Falcons away. Morgan Farr led Southwood with 13 points and five steals. Ashley Smith added eight points and eight steals, and Sierra Stout finished with eight points and three blocks.